Do you need wedding insurance? Permits for your DJ, parking, a large gathering, or alcohol service? Let’s face it, insurance, permits and licenses are … intimidating. How on earth would you go about selecting a blanket insurance policy that covers illness, inclement weather, or other unforeseen loss on your wedding day? Do you even need a wedding insurance policy or permits or license? Wedding insurance can be pesky to think about, but you can’t afford to write it off. Today’s show explores a critical aspect of wedding planning that is not so fun or glamorous, but is SO IMPORTANT! Your venue is a great place to start gathering information about what types of wedding insurance are required. To start, I recommend asking the manager or events coordinator what types of coverage you need to secure. Next, be sure to ask for referrals to companies that they have worked with in the past. Lastly, I also share tips on where to find more information! Disclaimer – I am NOT an insurance or legal professional, and this episode does NOT constitute legal advice! 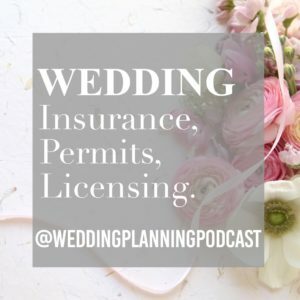 Specific questions about wedding insurance, permits, or licensing needs? Consult with a registered insurance agent or legal professional for more advice. I’d recommend a phone call to your auto or home insurance provider, and they can point you in the right direction. 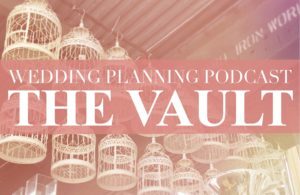 THE VAULT | Sign up to access 75+ member’s only episodes of the Wedding Planning Podcast!